BOT projects with the most toll stations also kept the top in revenue in 2018, according to the report of the General Department of Roads. 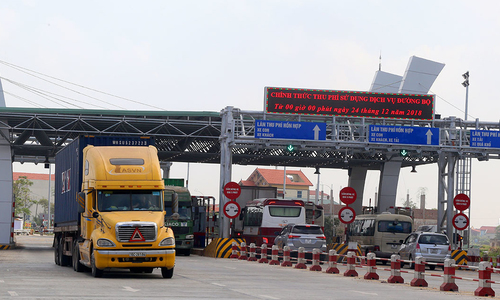 The General Department of Roads has reported to the Ministry of Transport about total revenue at 57 BOT projects with 63 toll booths in 2018 being over VND 12,192 billion. With this result, accumulated revenue from projects to the end of 2018 is over 47,442 billion dong. Among 57 BOT projects, the biggest revenue in 2018 is the Hanoi - Hai Phong highway construction project with a total revenue of 2,038 billion VND, equivalent to more than 21.4 million vehicles. This is also one of the most toll stations in the country with 3 stations. In particular, the station on the expressway in 2018 earned more than VND 1,200 billion. In a report that has been published, the project owner of Hanoi - Hai Phong expressway project said that each day, it collected 5.7 billion dong but businesses still lost an average of 2.5 billion dong per day, equivalent to 900 billion dong. each year. According to the report of the General Department of Roads, the second highest revenue is the expansion project of National Highway 51 (Vung Tau - Dong Nai) which also achieved revenue of 730 billion, equivalent to 30 million vehicles. This project has a length of 72.7 km but also has 3 toll booths. Many opinions said that this is unreasonable and needs to be changed accordingly, but so far the number of stations here is still maintained at 3. The report of the General Department of Roads also stated that the projects to upgrade Phap Van - Cau Gie route had the turnover of over 700 billion dong with 20.3 million vehicles, equivalent to an average of nearly 2 billion dong per day. This number has no difference with the data previously published by the enterprise. At Phap Van - Cau Gie project, the representative of the investor stated that the amount of BOT fee collected on this expressway is about 2 billion dong per day, especially for the Tet holiday, it can reach 2.5 billion dong. Dong Nai Bridge construction project also has revenue of up to 590 billion VND, followed by the project of renovating and upgrading Highway 1 section of Hanoi - Bac Giang 460 billion VND, the project of expanding National Highway 1 section Phan Thiet - Dong Nai 340 billion ... The project with the lowest revenue is the construction of Thai Nguyen - Cho Moi road with nearly 23 billion VND, the project of building a new Viet Tri bridge (Hac Tri bridge) with 63 billion dong. Recently, a number of cases, such as a business employee using software to hide the fee, have raised doubts about fraud in publicizing fee revenue. Currently, the management agency monitors the toll stations periodically or unexpectedly by organizing inspection teams to compare revenues in those days with before, or based on probabilities through the toll station's data. To improve efficiency, the General Department of Roads is implementing a monitoring project through direct transmission of data at toll booths to the system of management agencies. In February 2019, the pilot will be piloted at 3 toll booths before replication.